Vice president and his wife Jill reported income of $385.072 on their 2012 tax return, but when it comes to helping those less fortunate than themselves, they are skinflints. 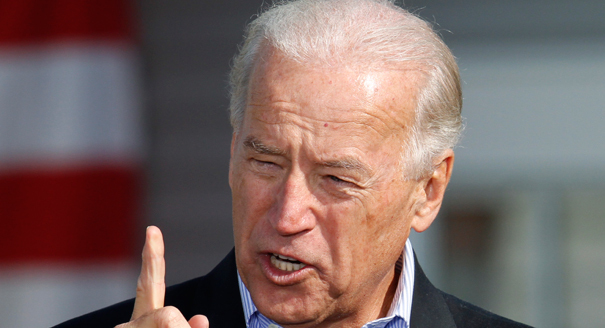 The Bidens reported a total of $7,190 in charitable contributions or 1.9% of their total income. While that is in line with what the average American gives based on their disposable income, the Bidens certainly are not average with earnings that are closer to the liberal much-reviled 1% than anything else. The Bidens are certainly free to spend their money any way they see fit, but if I can donate about 6 times as much percentage wise on about one-sixth the income, certainly our vice-president can do better. Then again liberals are the masters of hypocrisy. On Saturday during a speech vice president Joe Biden referred to a crying baby in the audience by telling the crowd that the baby knows what kind of a future it has under a Romney administration. Biden was addressing supporters in Florida when he made his remarks. They eliminate help for middle-class families who want to send their kids to college like that beautiful baby over there. I don’t blame her for crying! I don’t blame that baby for crying! That baby, that baby, that baby knows what’s in store for him or her if Romney wins! I’m glad someone understands my speech! If the baby was thinking about anything political, it would have been far more likely that it was more worried about the additional $5 trillion in debt that the Obama administration has piled up in less than four years that he/she will have to pay for in his or her lifetime. That should be enough to make both adults and babies cry. The New York Post reports that a fundraiser for President Obama’s re-election campaign headed by Vice President Joe Biden was not exactly the hottest ticket in town yesterday. Compared to Obama the $5,000 a-head-fundraiser should have been a bargain but apparently weak demand led the campaign to say the fee was “negotiable” which must be an embarrassment for a sitting vice president. Maybe the setting of the Pool Room at the Four Seasons was a little too ostentatious for a city that has been distracted by the Occupy Wall Street protesters lately. Barack Obama who used an effective grassroots campaign in 2008 to help propel him to victory is finding that motivating them this year is much harder. According to ABC News a campaign website set up to track grassroots fundraising reported 11,518 donations through midday on Sept. 30 which was well short of their announced goal of 20,000 donations. Even an offer to the two top online fundraisers of a personal phone call from Obama or Biden to the person of their choice wasn’t enough motivation to supporters. Obama is still raising plenty of money for his reelection campaign but the failure of the online campaign and the backlash of previous supporters on Wall Street are showing that there are serious chinks in Obama’s armor and don’t portend well for him in 2012.